On Monday our friend Jim took Jan and I in his yellow Jeep for some off road exploring in the desert north of Lake Havasu City. We were joined by his Canadian friend in a white Jeep — it’s smart to travel with others when going off road. We spent about 4 hours in the desert, most of which was spent exploring on foot a wash that had formed a long gorge. After walking into the gorge a mile or so, we had to turn back because a large rock fall blocked our path. Here are some photos from the trip . . .
Merry Christmas from Lake Havasu! Here’s the “official” boat parade video. Merry Christmas from Tom & Jan! 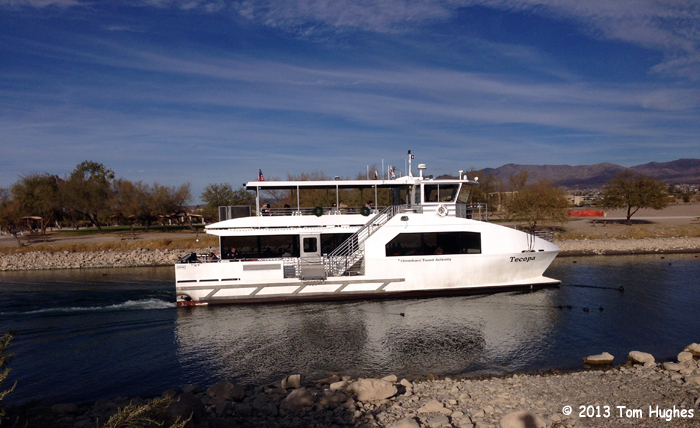 So every hour on the hour (from 6:45 am until Midnite) the Tecopa ferry boat departs from the London Bridge dock and takes its load of gamblers across Lake Havasu to the Havasu Landing Resort & Casino. From our campsite we can see the ferry come and go, and exactly 20 seconds after it passes our campsite, the waves from the Tecopa’s wake roll onto the shore. Now that’s regular. Jan & I plus our friends Jim and Marianne took the ferry to do some gambling. The boat ride was fun. However, entering the casino was like walking into an ashtray which made it difficult to concentrate on losing (as I did — but just $20). I was able to take a photo inside the casino of Jan playing a slot machine, but a guard told me not to take anymore. He had a gun. I put the camera away. 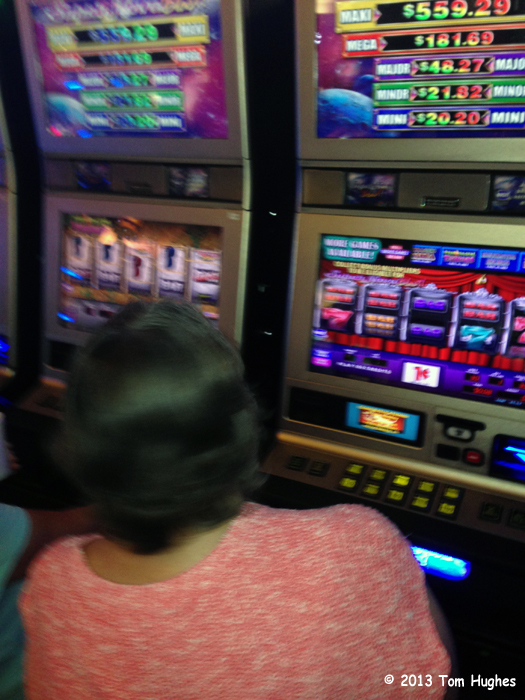 The photo is shaky and blurry which pretty much summarizes our gambling spree. Jim and Marianne made the trip fun, but I think we’ll stick with Megabucks and Powerball. 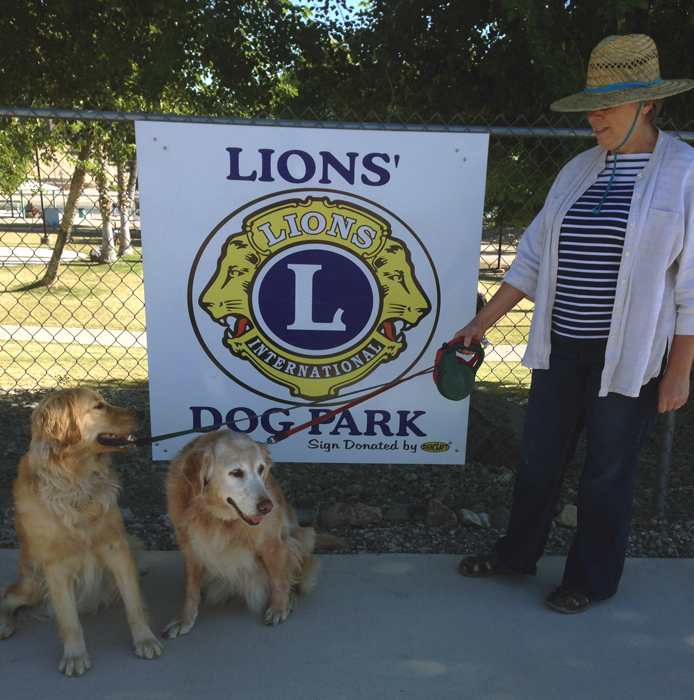 Almost since we arrived in November, we try to get our Golden Retrievers (Ellie & Flirt) to the local dog park as often as possible. Ellie is over 12 years old so we can’t take her as often as Flirt — who, with her energy, could go there several times a day. However, when we take Ellie, she barks, prances, and runs for a good 10 seconds. Then that’s pretty much for her. On the other hand, Flirt is . . . well, very active. We watched a TV show on the type of dogs used for bomb and drug detection. Bomb detection dogs are slow and methodical while drug sniffing dogs attempt to be at all places at once, constantly moving with zero attention span — Flirt. 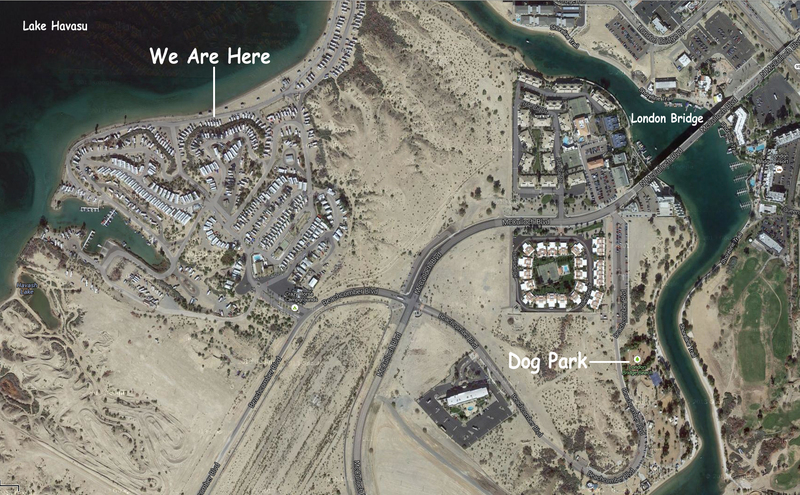 Lion’s Dog Park is about a mile from our campground. So we open the hatch to our Honda CRV, load the dogs, and a few minutes later they’re running with the pack. Last week Flirt met up with two other Goldens (one with just 3 legs) and it was playtime . . .